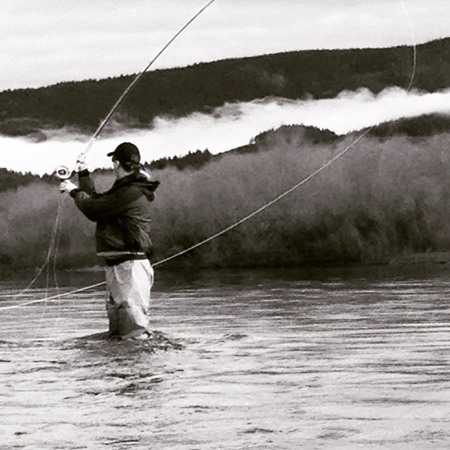 I had a chance to get out on the water this week with fellow angler and regular steelhead bum Colton Schwenning. 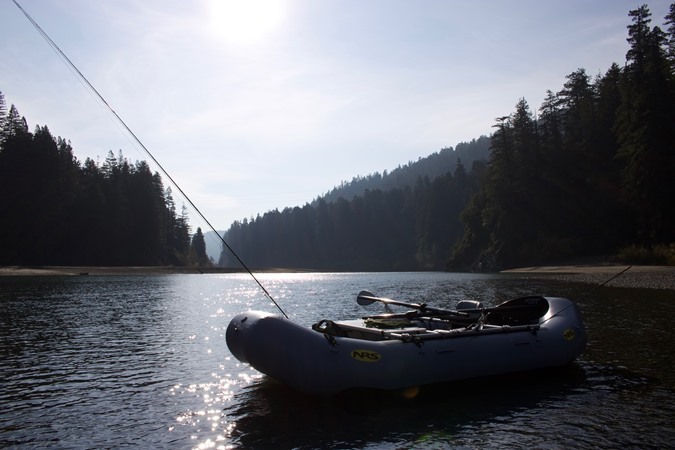 I was excited to use my new 14 ft raft for the first time and do a little scouting to see if any fresh fish had come in from the salt despite the lack of rain. It didn't take long. 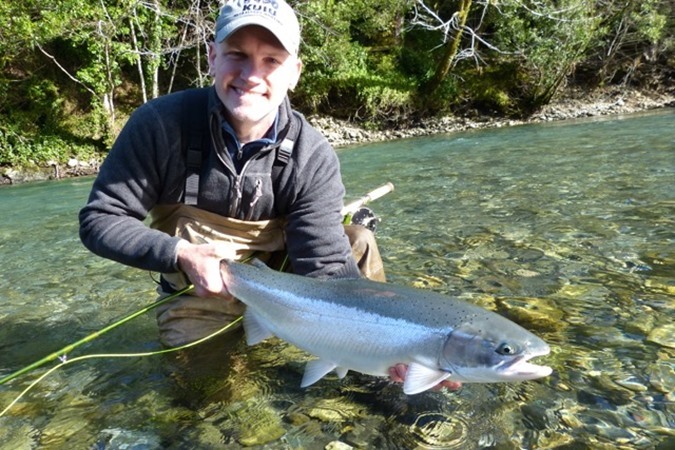 I found a beautiful dime bright hen that was all too eager to come to the fly. 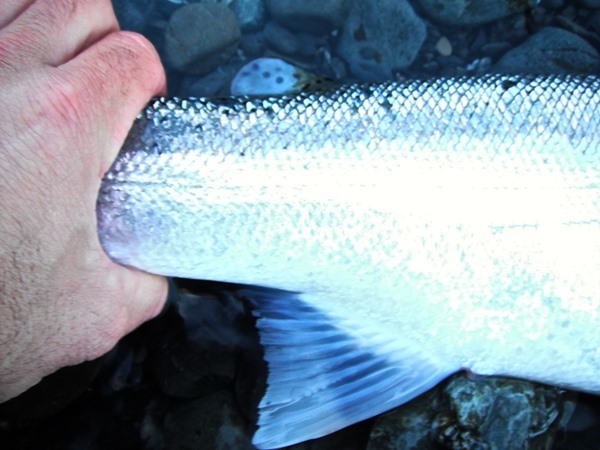 A sure sign that even with low and clear conditions the steelhead are making their first push on the coast. We ended the day with Colton finding two nice half pounders. 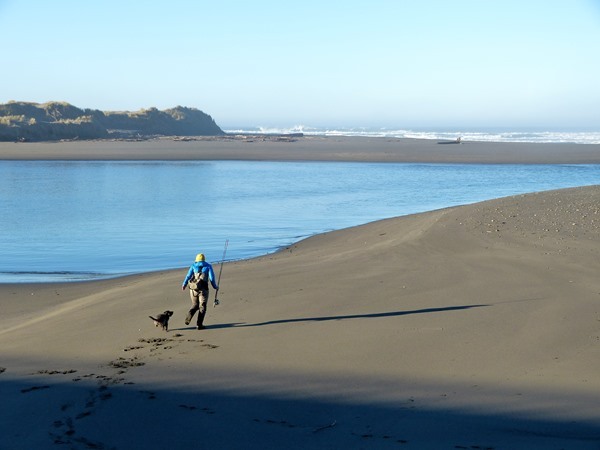 The weather was beautiful and it was exciting to see a river transformed from what is usually a burly torrent of water to a gentle coastal stream. 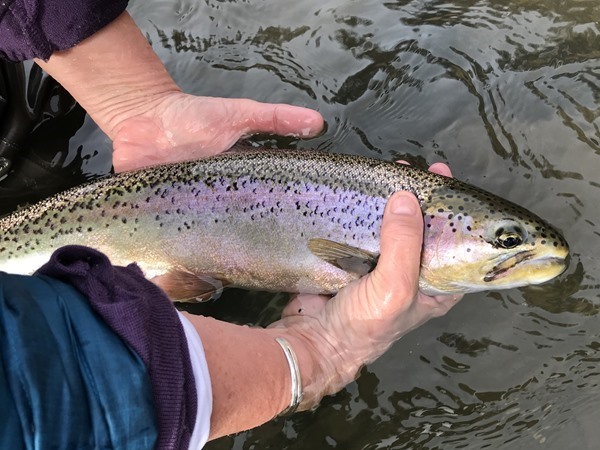 All in all it was a great day and the fishing did not disappoint.Dry conditions continue but perhaps not for much longer. Wet weather is forecast on the coast early next week with some projections calling for half an inch of rain. While this isn't a significan amount it might be enough to coax a few fish to begin moving up river. 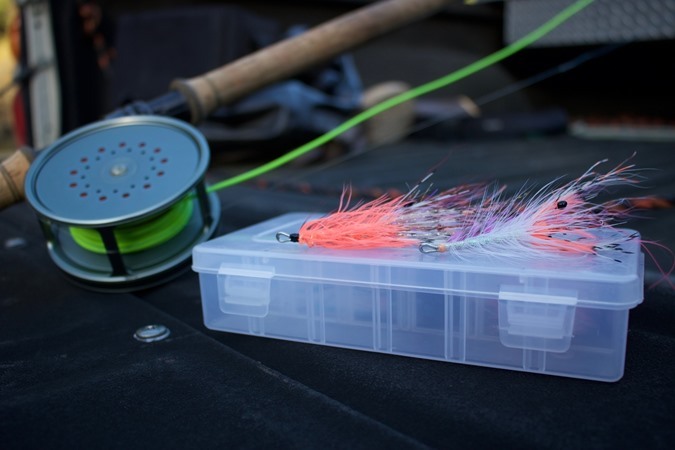 Some of the smaller coastal systems have closed this week due to low flow restrictions, but there are still plenty of great options for wetting a line and hoping for the tight line grab of fresh chrome here on the North Coast!See you on the water. A beautiful bright wild hen on a clear day. Always amazed. Always grateful. New whip ready for action. 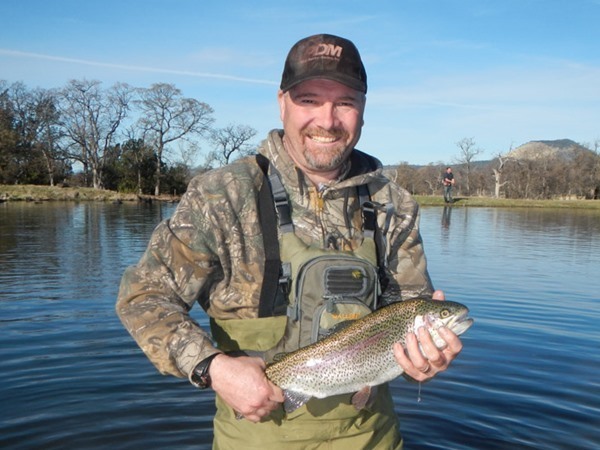 I spent the past two guiding another group from the Diablo Valley Fly Fishers. 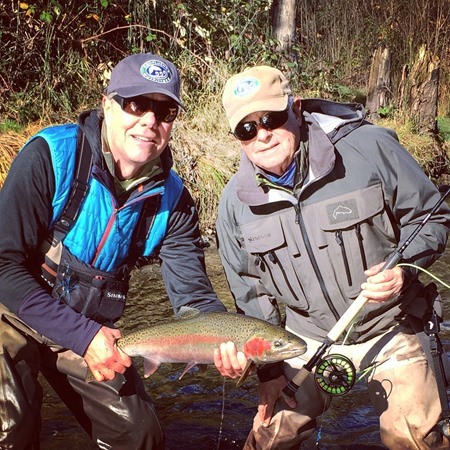 My guests Rich and Al nymphed on Thursday and the fishing was tough. 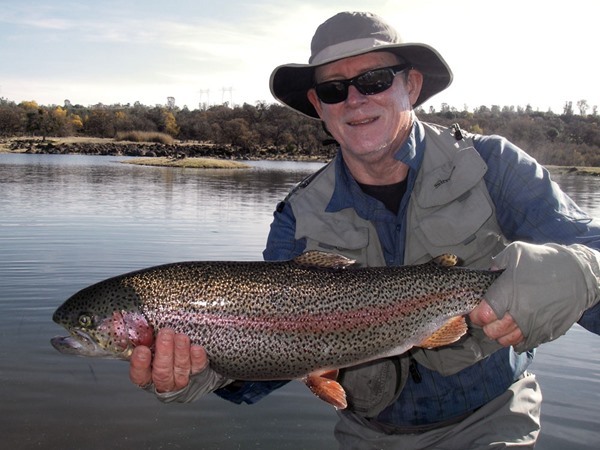 Al hooked one very nice adult while we floated the upper portion of the river. Today was a swing day with my guests Diane and Karen. They were very thorough as they worked all the runs and Diane was rewarded with a small native adult. They fished with Gino on Thursday. Karen swung-up three adults and Diane hooked into a brown trout. Not to sound like a broken record, but conditions will likely not improve much until we receive some much needed rain. 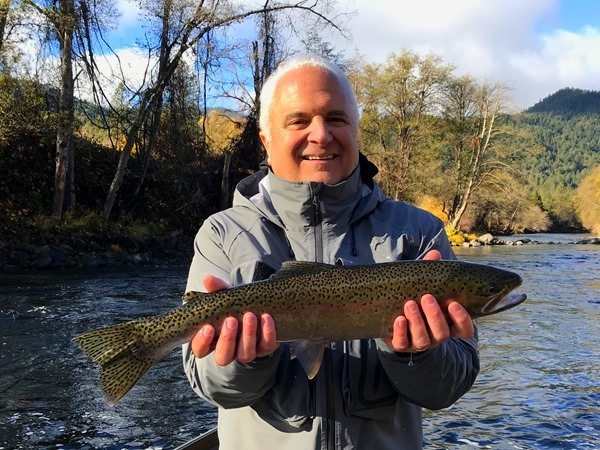 Longtime guest Ron had this to say about his two-day trip to Eagle Canyon:"The fishing was very good the first day and much slower the second day. The fish are getting bigger and bigger!! 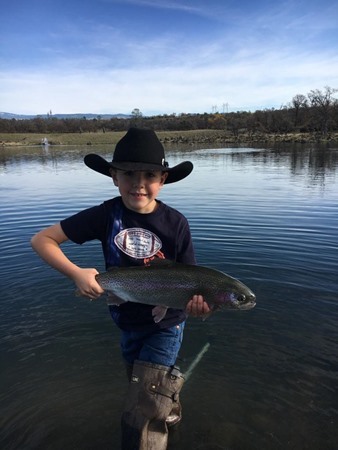 All of us caught fish both days and had a great time." 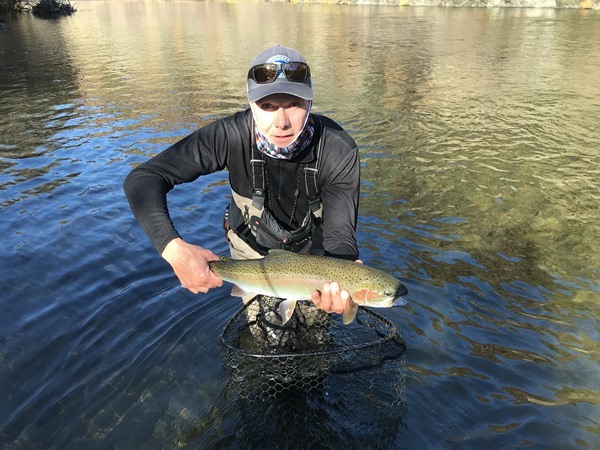 This report is from long-time Eagle Canyon guest Dave Earl, who fished yesterday: "Stripping streamers was on fire in the morning, all 3 of us had quality fish landed within minutes. Later we had to switch to nymphs under an indicator to get grabs. We all landed about 10 fish each including a 10 pounder and a 12 pounder . I'm pretty sure the same 12 pounder was caught a second time about 2 hours later. 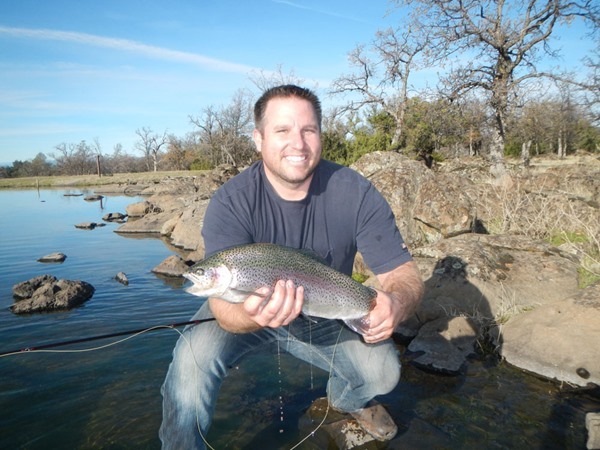 Eagle Canyon: a one of a kind flyfishing experience!" Today was Opening Day at Eagle Canyon. 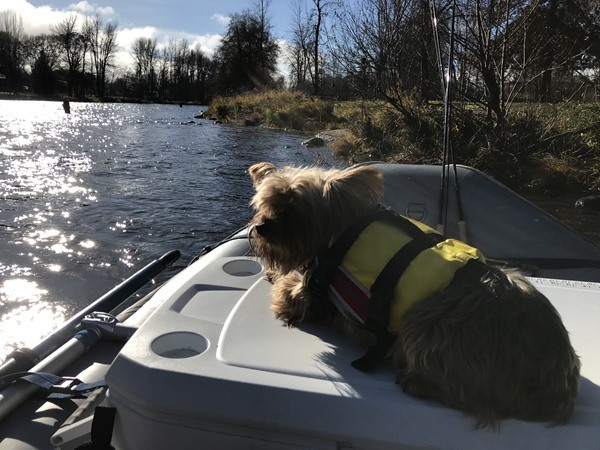 We enjoyed a beautiful day and some pretty good fishing, too. The weather was almost too nice - there wasn't a ripple on the surface all day. 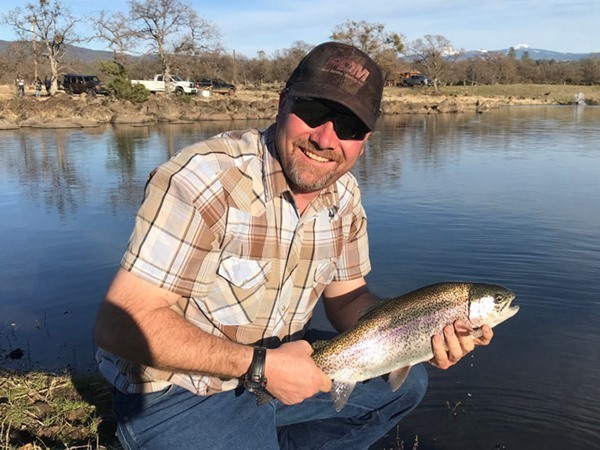 The bite was definitely slow for Opening Day but everyone hooked into multiple fish. 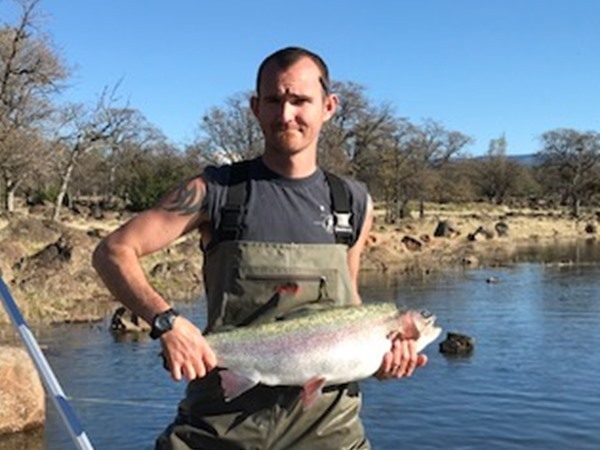 The largest to hand was about 7 pounds and I saw quite a few 10 pound plus fish hooked briefly. 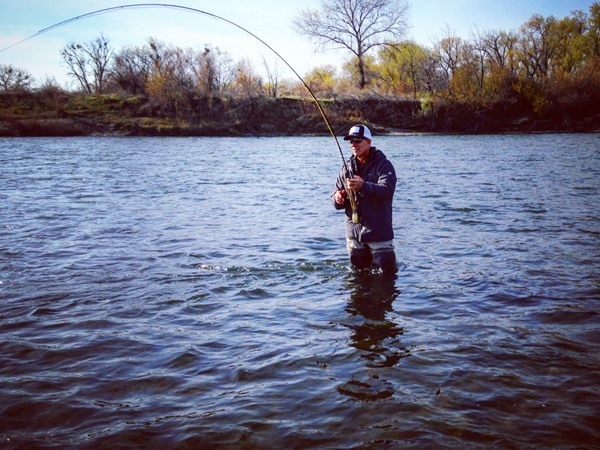 There are some big fish out there with flies (if not entire leaders) in their mouths! 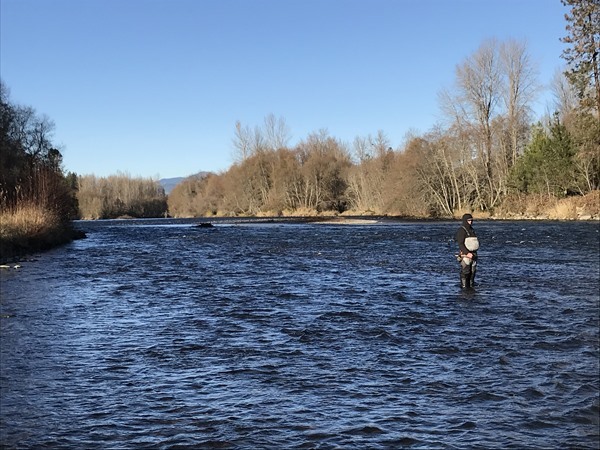 Trinity River: Dec 9, 2017, by Brian: Low & Clear! Peter Santley and I guided a great group of guys the past two days. 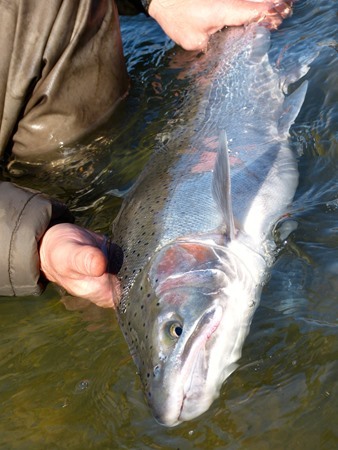 The air temps have been very cold this week, so the water temps are dropping and the river is very low and gin clear. Fishing was very tough for both of us both days. Jim landed landed a nice wild fish on Friday, and we had a brief hook-up today. We really need some rain for conditions to improve. 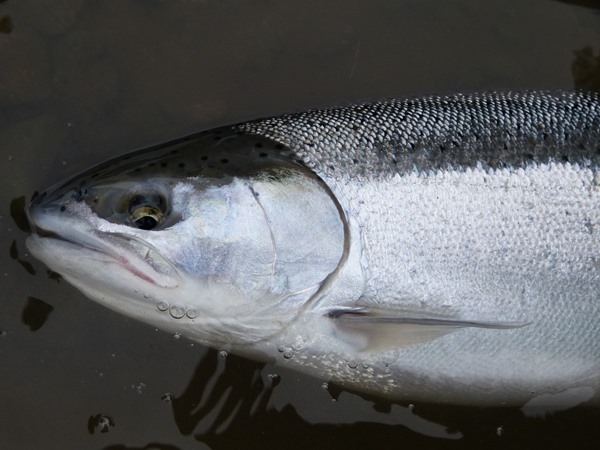 I'm hearing rumors there is a new batch of fish moving upriver, so hopefully we will see them in the coming days. 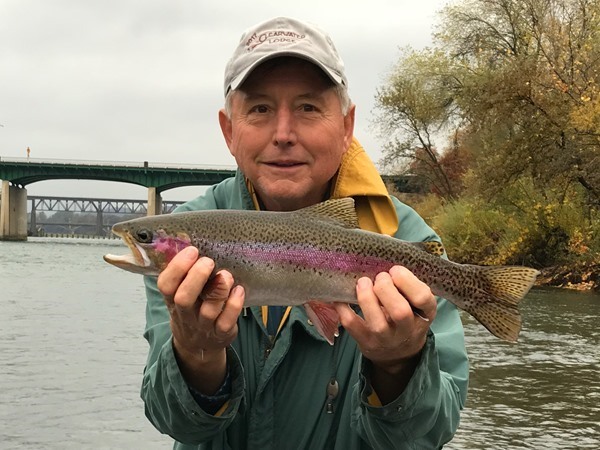 Jim with a beautiful wild fish! 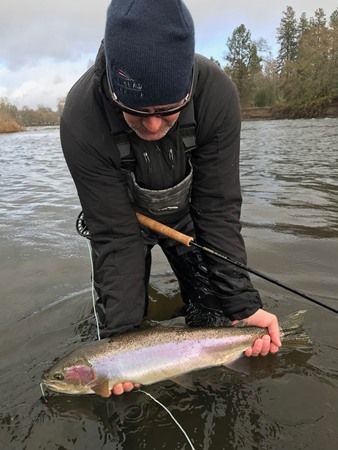 Trinity River: Dec 9, 2017, by Mike: Low, clear, and cold............still fun! 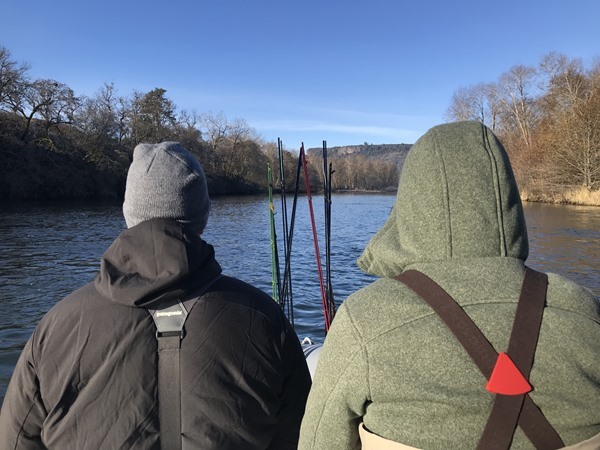 Spent a cold and clear day on the Trinity with Nick and Dave. 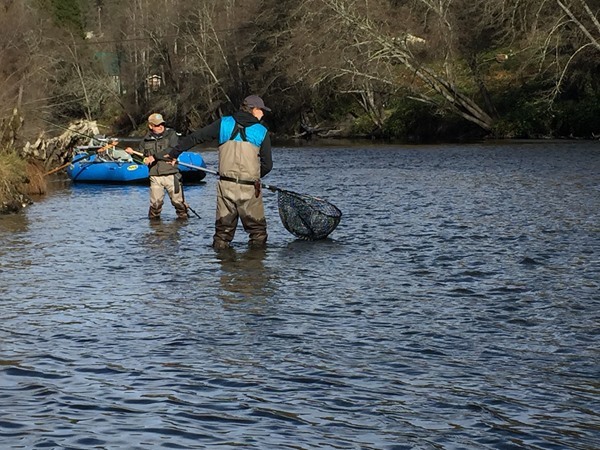 We had a great day as far as weather and conversation, but the fishing conditions were tough. The low and clear water proved to be a challenge. 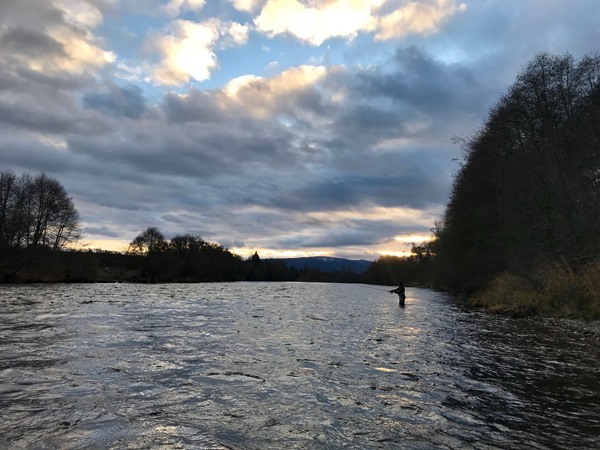 We nymphed most of the day but also swung flies with single hand and traditional spey rigs. We touched one fish briefly on the swing and had two nice encounters on nymph rig. On the second grad we were able to bring a beautiful wild hen to the net. All in all an enjoyable day, but it's hard work hooking up right now. Dave trying his hand with a single hand swing set up. Finally! A nice reward for a long day fishing for Nick! 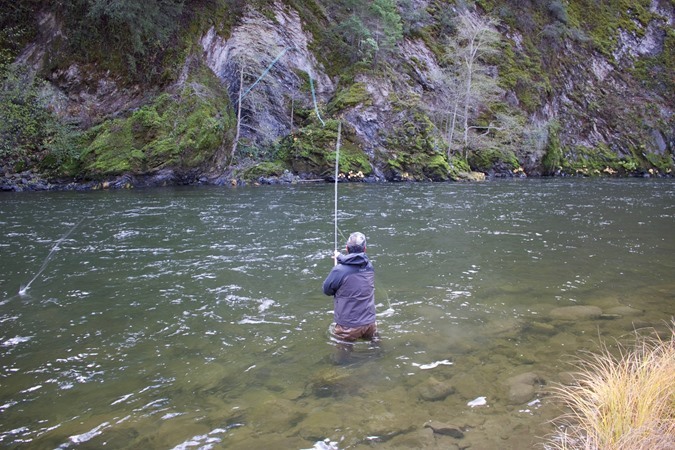 The upper Rogue has been fishing awesome this past week. The weather has been amazing, with temperatures hitting the 60s in the afternoons. Leslie and I have been hooking fish on the swing every day. 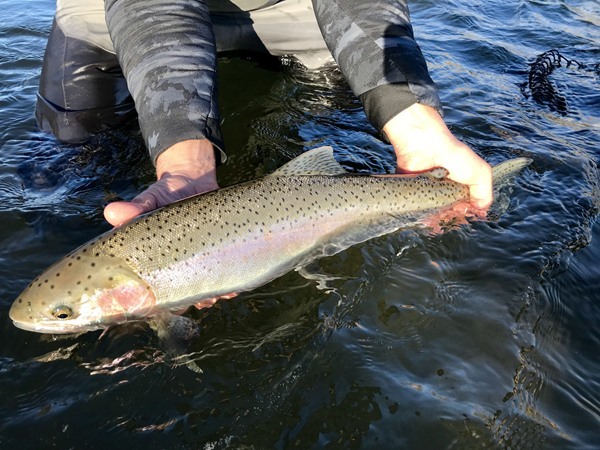 Our clients have been landing mostly wild fish in that 6-8 pound range.We rarely see more than one other boat a day on the water. 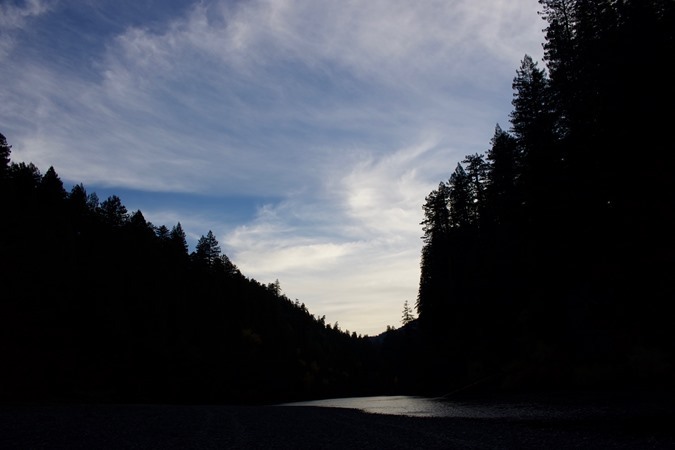 For late fall steelhead, it doesn’t get better than the upper Rogue! I've been up at Eagle Canyon pretty much every day this week making preparations for Opening Day this Saturday. The lakes look great! 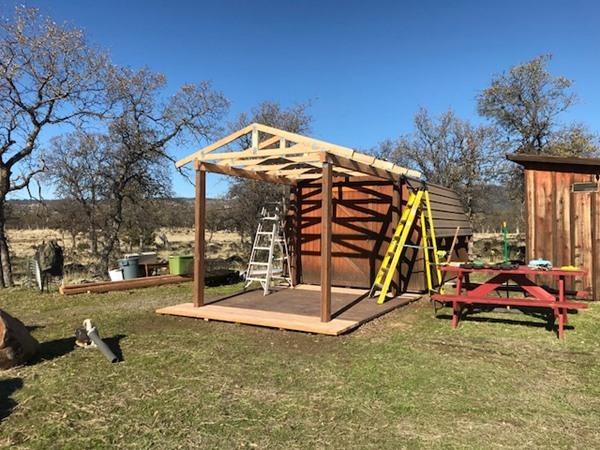 Our shade structure by the upper shed finally bit the dust this winter and I am busy building a replacement. We have plenty of openings left in December but we're down to just 5 open weekends left for the whole season. Mid-week availability is pretty good for the most part. 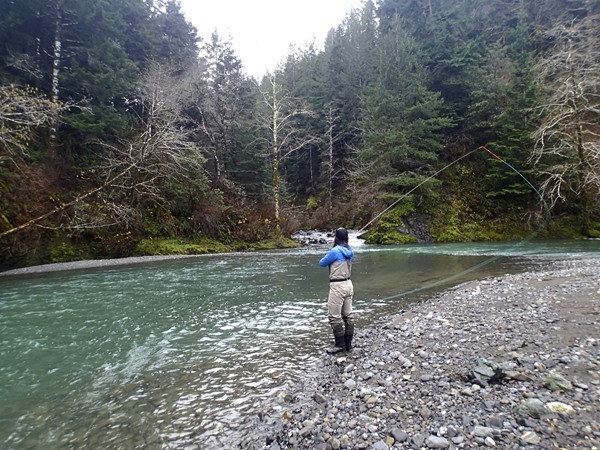 I had a fantastic time with Doug yesterday, swinging for steelhead. 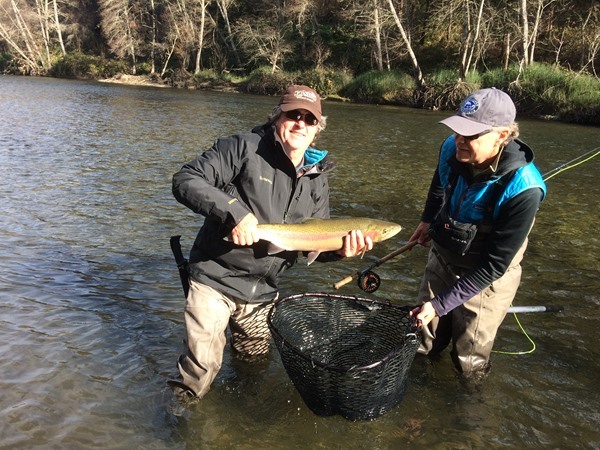 The fish were very grabby and the ones we encountered were prime specimen Rogue steelhead. 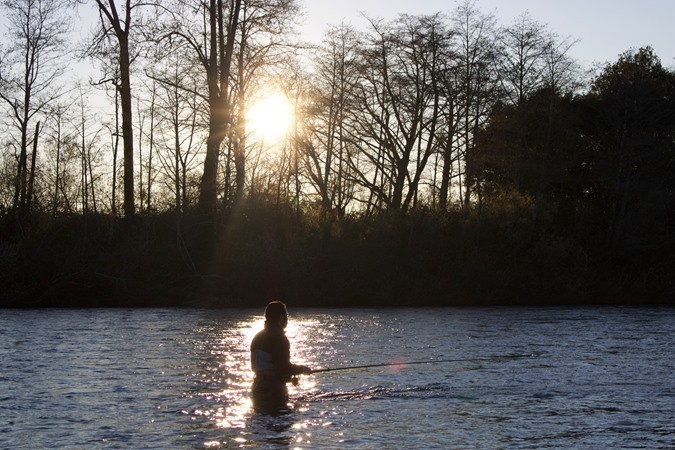 If you're looking for an uncrowded river with excellent swing water, look no further. Bent to the Cork ! Today I guided Lloyd and Jack on the lower Sac. We had a little rain to begin with, but then it stopped and we had a very good morning. Both hooked and landed several really nice fish, all the while thinking the weather gurus were way off with their forecast. Our good fortune ended around noon. 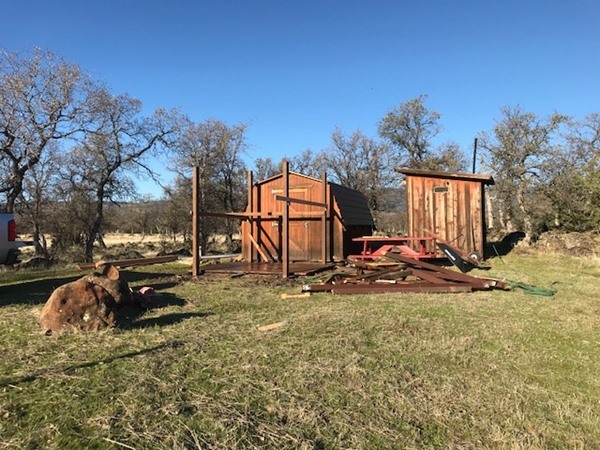 A system moved through and dumped rain for about an hour...and then there was the wind! The afternoon was very different from the morning, we had a mixture of calm weather, wind and rain...and for whatever reason, it just shut the bite down. All in all, it was a good day for the end of November. 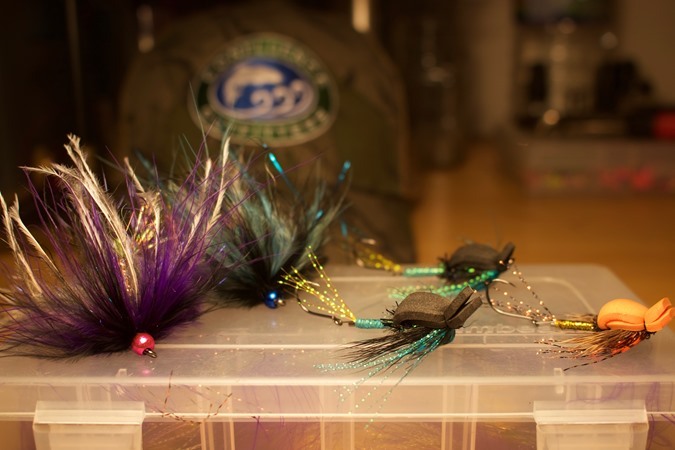 I'm looking forward to spring fishing on the Sac! Lloyd with a really nice fish! 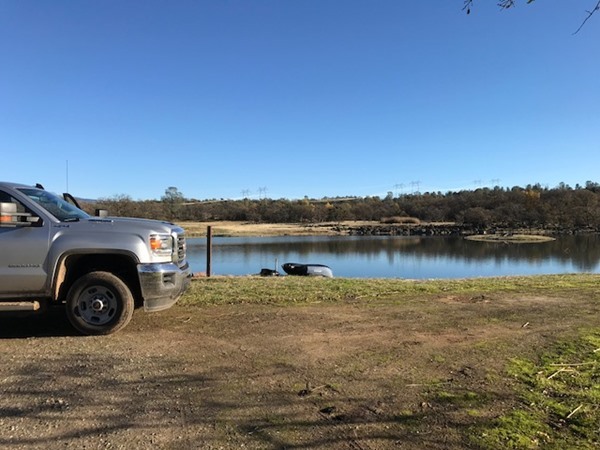 .The Trinity Basin has recieved several good bouts of rain this Fall with the most recent being this past Sunday into Monday and blew the river out from Rush Creek down. 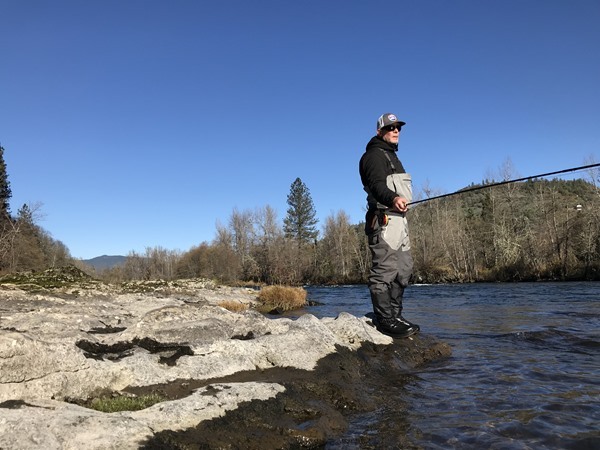 The Trinity was back in shape in the upper reaches on Tuesday, the recent rains have been just what the Doctor Ordered, Steelhead are on the move. 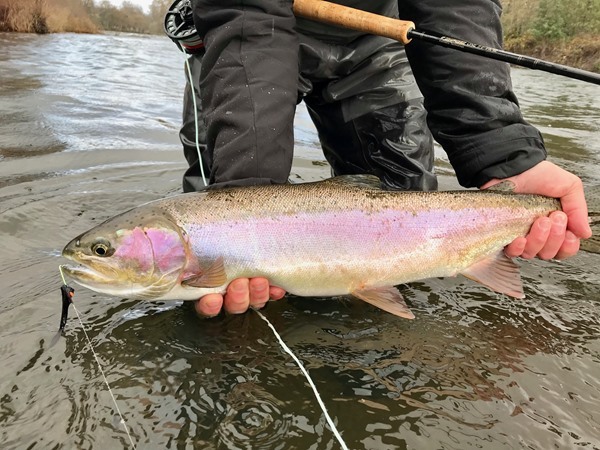 The Summer/Fall fish are making there way to there final destinations and Fresh Early Winter Steelhead are filing in, right on there heels. 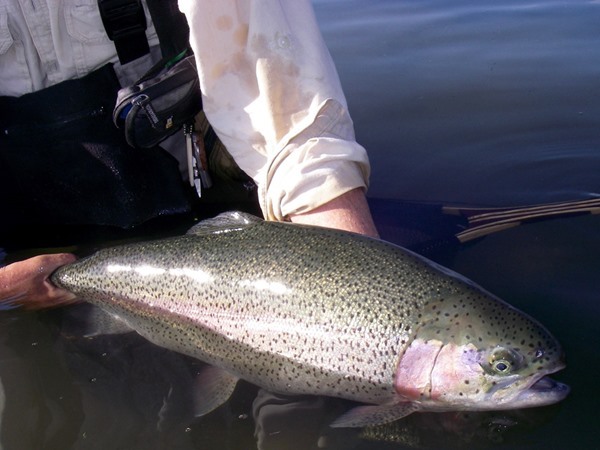 As long as the Weather stays active, like it has, the fishing should remain good for the forseeable future... 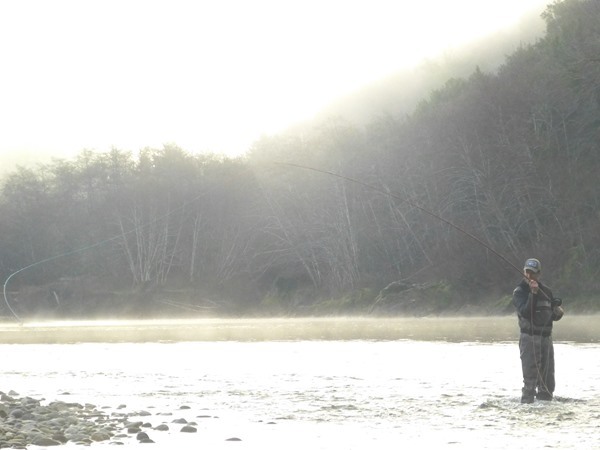 Happy Thanksgiving and Tight Lines ! I had high expectations when I met Earl bright and early this past Saturday outside of the general store in Salyer. 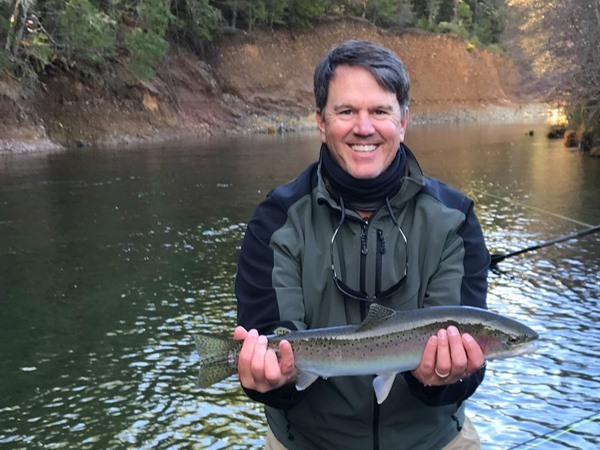 We were set to do a day float from Hawkins Bar down to the Salyer bridge, and with the Trinity on the drop after a big push of rain I was hoping we would find a fresh fish or two somewhere along the way. 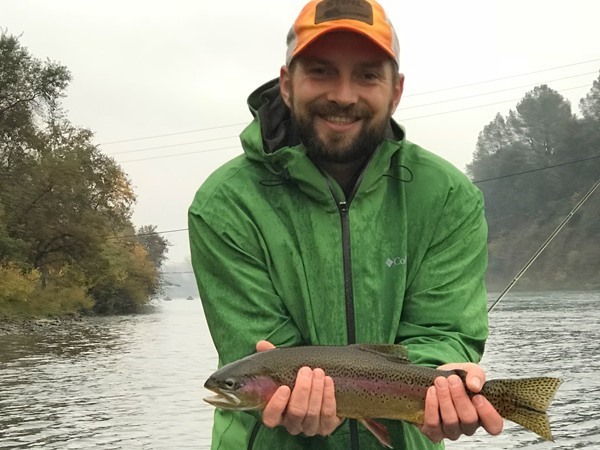 The night before had been cold, with temperatures hovering around freezing, so I felt confident in the bigger bugs and heavy chunk of T-14 we were throwing. 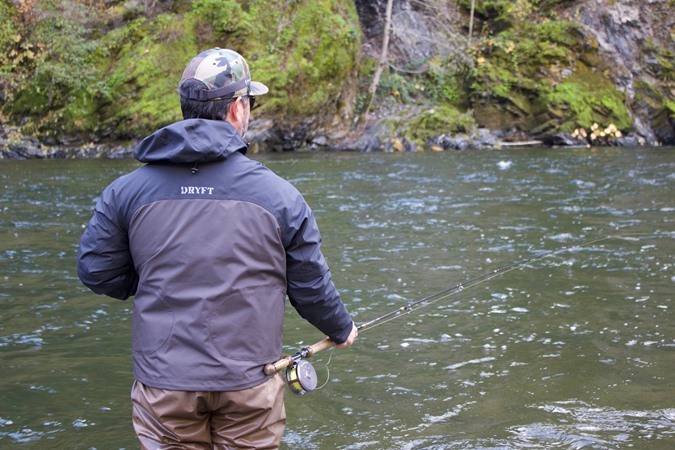 We spotted a few steelies holding in a tailout behind dark Chinook but couldn't get one to commit. Earl finished strong with an end of the day half pounder that was as bright as bright could be, but he gave us the fin when we got him to the bank and slipped off the line. 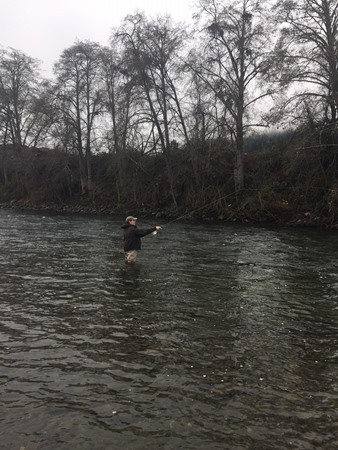 I was surprised to see few fish in the lower river after such a healthy amount of rain. 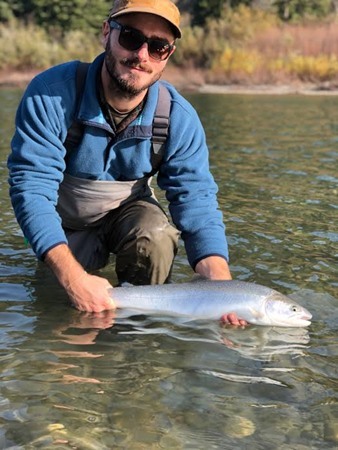 November is usually when the first larger winter runs start to make an appearance, but all of our efforts to find a big adult went unanswered. In the end it was still a beautiful day to be out on the water. 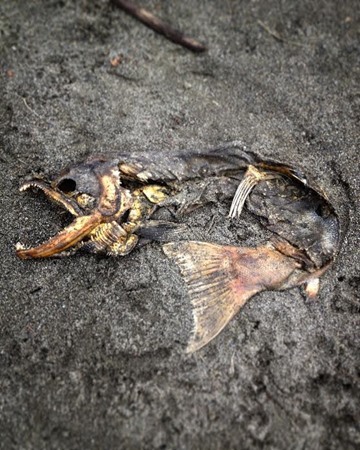 Right now all rivers on the North Coast are on the rise and blown out. When they drop in it'll be game on for the first hopes of swinging up a coastal chromer. Get your game face on, the shows about to begin. 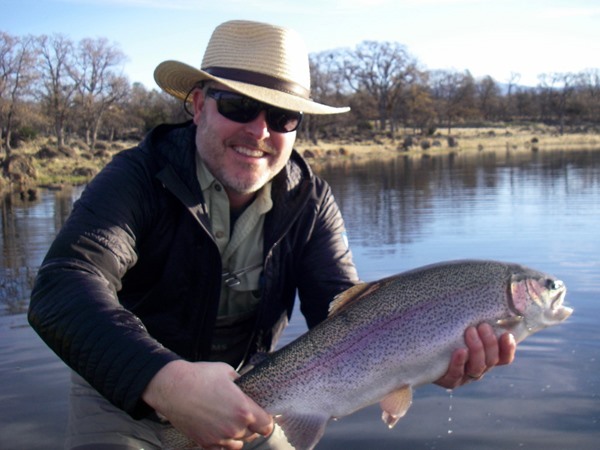 My second day with the Diablo Valley Fly Fishers was even better than yesterday. It was a cold morning and VERY crowded on my float. We took our time and hooked three fish right at the put-in. 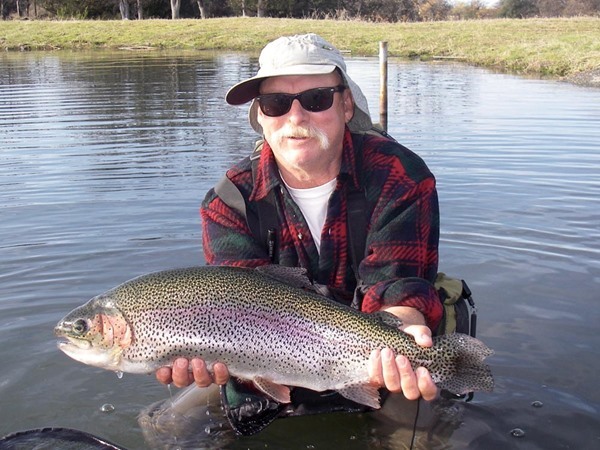 Fishing remained consistent for the first half of the day, but slowed down after lunch. We started with a very good landing percentage - but then the wheels kinda fell off. All in all, Rich and George had an outstanding day hooking nine adults and landing three. 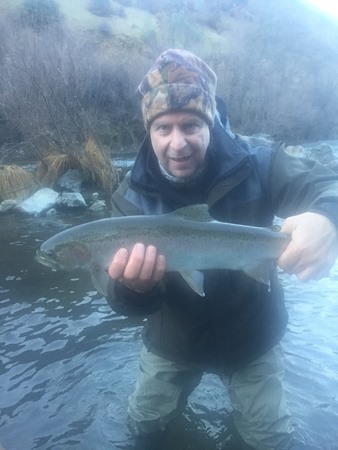 George with his first steelhead of the trip! 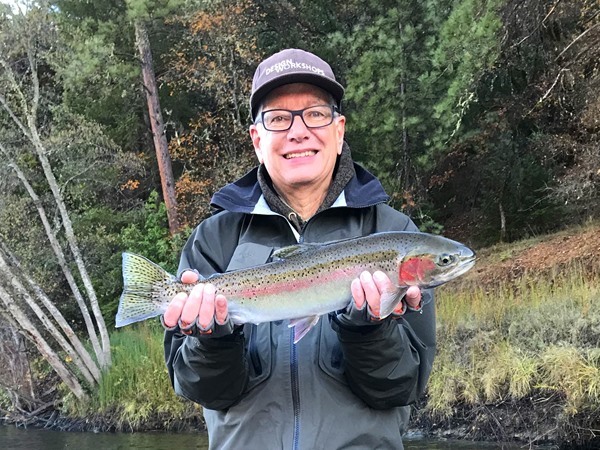 George with a beautiful wild fish! 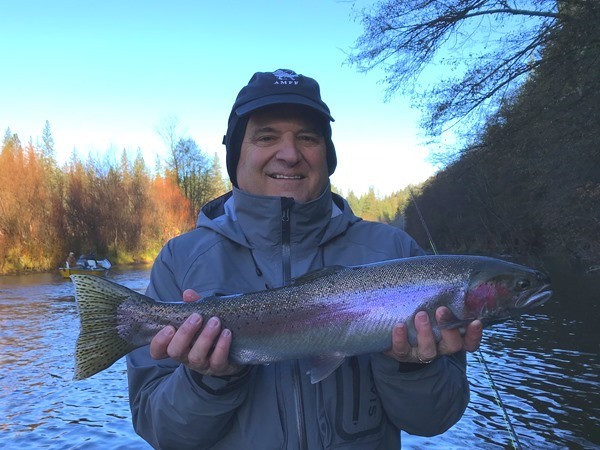 Rich with another nice hatchery steelhead!